Pick a Saturday to venture across the Boulevard Bridge toward Westover Hills and you’ll discover the expansive South of the James Farmer’s Market. 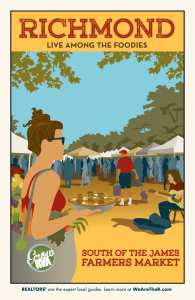 Located in beautiful Forest Hill Park, the producer-only market – meaning that all products for sale must be handmade or homegrown in Virginia by the vendor – is one of few Richmond area markets that run year-round. Summer hours (May – October) are 8 am to 12 pm, and here are just a few examples of the one hundred plus vendors. Appealing to a plethora of gardeners in the area, the folks at Moose Hill Worm Farm are experts in worm poop, and you’ll find this very question in giant letters across the top of their tent. More politely referred to as worm castings, the founders of the worm farm discovered that their application was a “powerful organic soil amendment” while tending to their alpaca farm. Farming worms for their castings while simultaneously working with alpacas, “Moose Hill Alpacas” soon became “Moose Hill Worm Farm” when the owners decided to go head first into the worm farming business and divert all of their attention to this industry. Regularly available at multiple markets and festivals outside of South of the James, as well as a handful of local stores, the castings produced by Moose Hill Worm Farm have drawn a great deal of attention and business for the owners. Look no further than Bon Air Naturals. 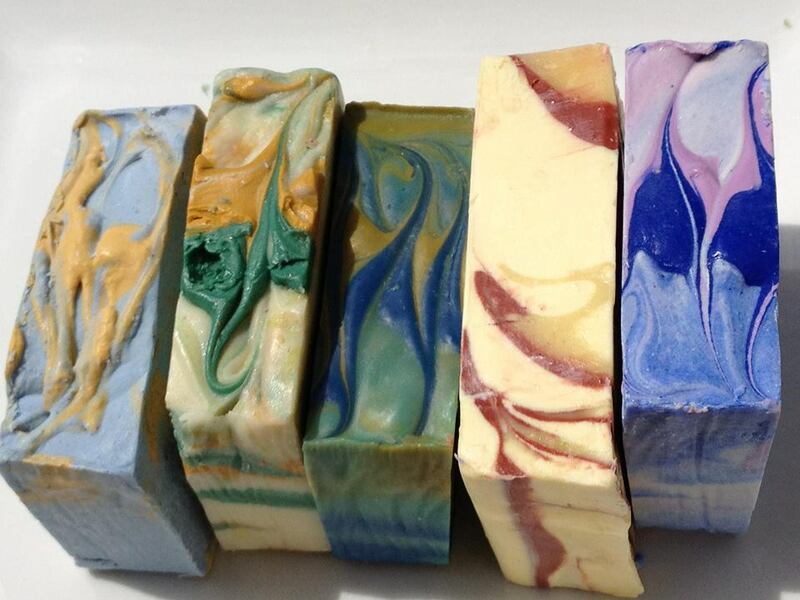 Leslie Arthur began creating simple soaps and bath bombs to appease her inner entrepreneur, while remaining at home with her children. Each product is hand poured, cut, and wrapped in her home in Bon Air, Virginia, and they’re absolutely beautiful. 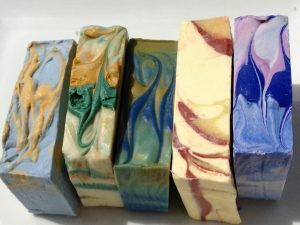 Marketed as “soap with simple ingredients and artistic flair,” Leslie sticks to three simple main ingredients: olive oil, coconut oil, and shea butter, producing soaps that boast gorgeous colorful swirls and smooth surfaces. With continuously tweaked product lines and custom request opportunities, Bon Air Naturals is a must-visit. After all, who doesn’t like to be clean? All that walking through the market can work up an appetite, right? Introduce yourself to Grammy O’s Sticky Buns, a generations-old recipe reflecting the perfect combination of cinnamon, brown sugar, and hand-rolled dough. Years ago, in Bucks County, Pennsylvania, Margaret Landis Schmell Overholt – Grammy O – poured herself into the meals she made for her family, expressing the importance of enjoying delicious, homemade food with loved ones. Margaret’s granddaughter Heather’s thoughts always seemed to return to Grammy’s kitchen – specifically her sticky buns. After months of experimenting and taste-testing, she rediscovered the perfect combination of ingredients for which the buns are famous and Grammy O’s Sticky Buns returned. You may find yourself salivating while reading; but words cannot do these wonderfully sweet and savory flavors justice. You’ll have to try a Sticky Bun for yourself. Relatively new to the farmers market, Ninja Kombucha offers new and exotic twists on a healthy, thirst quenching beverage that’s been around for thousands of years. You may be asking yourself, “What in the world is kombucha?” Simply put, it’s a fermented mix of tea, sugar, bacteria and yeast, and often other ingredients of the brewer’s choosing, that create a probiotic, naturally carbonated drink. Ninja Kombucha puts its spin on the brew with wild blends like ‘Grasshopper’—a combination of lemongrass, hops, ginger, grapefruit, and green tea, and ‘Hibiscus Mist’—with black tea, strawberry, and blueberry flavors. If you have yet to try kombucha, or hadn’t heard of the beverage until now, then pay Ninja Kombucha a visit – sipping the drink is truly an experience that words cannot describe. This doesn’t even scratch the surface of the ten plus local farms at the market, the fantastic food trucks, or ninety-some other vendors. Spend your next day off at the South of the James Farmers Market, and you won’t leave with an empty stomach or empty hands. Visit http://www.growrva.com for more information. To download the 11×17 #RVAGuides South of the James poster, click here.